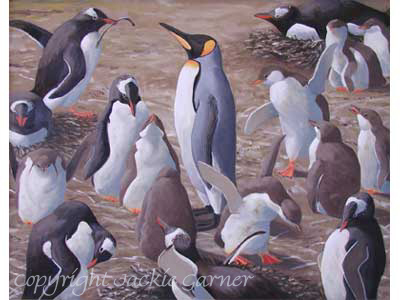 This page is dedicated entirely to penguin paintings because although my wildlife art spans the natural world, penguins hold a special place in my heart. My penguin paintings have led to me being known by some as "the penguin lady". 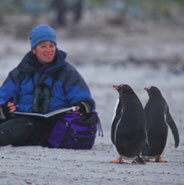 Painting penguins during a four-week tour of the Falkland Islands provided some of the most inspiring field work of my wildlife art career. I have to admit, I wasn't a huge fan of penguins beforehand but after a few weeks among feisty Rockhoppers, sleek King Penguins and adorable Gentoo, I came home completely converted. 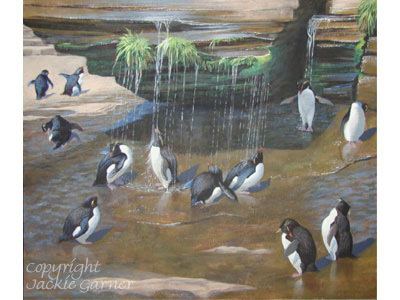 My favourite penguins were the rockhoppers, as you might guess since they feature so prominently in my penguin paintings. 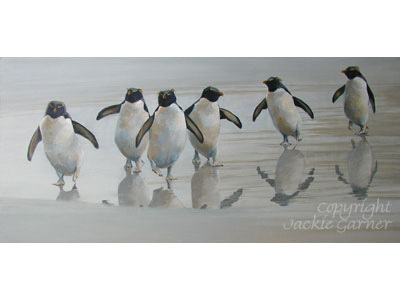 Watching them coming in from the sea was a special moment and resulted in Heading Home and Putting on the Ritz, two of my most popular penguin paintings. But there were other times that delighted me - watching them bathe in spring water or hop up and down the cliff inspired Rockhopper Showers (below) and Going Up, Coming Down. 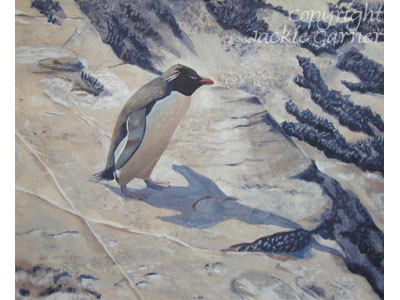 It's important to me that our wildlife is protected for future generations, so some of my penguin paintings have raised money to support the important work carried out by Falklands Conservation and BirdLife International. I'm happy to take commissions so if you have something in mind please do get in touch. Perhaps you'd like a memento of a recent trip; a reminder of a special moment; or an image of a favourite penguin species? It's just a phone call away!